If you’ve found fleas or ticks on your furry friend, you may be scrambling to stop the itch and find the quickest path toward eliminating the problem. No doubt you’re looking for the most effective flea and tick treatment for your dog that is both safe and effective. There are many different products that take aim at fleas, ticks, and other pests that take up residence on pets. Sprays provide quick, targeted action; some are made for using directly on your dog’s fur, while others are for treating your pet’s environment. Powders are a good choice if your four-legged friend isn’t a fan of being sprayed or objects to a flea dip or bath. Tablets or pills can also be a very fast-acting way to get a handle on a flea infestation, but these are intended for short-term population control—not necessarily as a long-term preventative medication. If you discover that your dog has fleas or ticks, you want to find a product that you can easily apply to your pet. With so many flea and tick treatments for dogs, you’ll be on your way to an itch-free and pest-free existence in no time. Here are the top flea and tick treatments for dogs that get two paws up. Make quick work of eliminating fleas and ticks with a convenient and effective spray, like the Adams Plus Flea and Tick Spray. This is our top overall pick for a flea and tick treatment for your four-legged friend. This flea and tick spray from Adams targets ticks, adult fleas, plus flea larvae and eggs. As a plus, it also claims to repel mosquitos. If you’re startled to find any of these invasive pests taking up residence on your pet, spray them with the Adams Plus Flea and Tick Spray for instant elimination. One tip is to spray the product on your dog’s fur, then rub it in with your hands to make sure it reaches the skin. Your dog may disapprove of the smell, but the results are worth it as the fleas or ticks instantly die. This product has earned a lot of praise from pet parents for its ability to provide quick relief to a dog suffering from an onslaught of fleas. It also breaks the life cycle of the fleas, thanks to an insect growth regulator chemical in the product. Of course, this is a flea treatment product—not a means of prevention. So while a quick spritz will kill any fleas or ticks onboard your pet, it’s not intended to be your only means of preventing a flea or tick infestation. But if your dog does pick up one of these pests, the Adams Plus Flea and Tick Spray will help you to quickly remedy the situation. If you discover that your pet has fleas and you need a fast-acting over-the-counter medication, turn to Capstar Flea Tablets for small or large dogs. These highly-effective pills for flea treatments are widely available. What really sets these apart as a good go-to flea treatment is the fact that the pill begins to work within 30 minutes of administering it to your pet. This means that your dog can begin to experience quick relief from fleas—and you can get some peace of mind. In fact, these pills are 90 percent effective at eliminating fleas within 4 hours. You should take note of two important facts when turning to Capstar Flea Tablets. First, these pills will only kill adult fleas. You’ll need to also use other methods to eliminate flea eggs and larvae that may be on your pet or in the environment. However, giving a flea pill will help to make sure that any live fleas still in the environment won’t re-infest your pet. Second, each pill is only effective for 24 hours. You’ll have to repeat once per day to continue to eliminate adult fleas. Capstar Flea Tablets are not necessarily meant for long-term flea control, and the price would make this an expensive flea treatment. Instead, using these pills for flea treatment will help you to get a quick handle on the situation and provide short-term relief for your pet from the bites of adult fleas. A quick chemical dip is a common way to treat a flea or tick infestation in dogs. The Happy Jack Kennel Dip II is a formula with a reputation for banishing fleas and terminating ticks and mange on your pooch. The Happy Jack Kennel Dip II is considered to be a broad-spectrum insecticide, meaning it will eliminate a variety of pesky hitchhikers on your dog. It is a water-based formula and relies on permethrin as one of its key active ingredients. The key to using this product effectively is to let it dry naturally. If you bathe your dog in it and then towel dry your pet, you will be undermining the effects that this formula can have. Some people felt that this formula wasn’t incredibly effective, but many times it has to do with not following the manufacturer’s directions for use. If you’re looking for a tried-and-true flea dip treatment for dogs, give Happy Jack Kennel Dip II a try! If you’re looking for a flea and tick powder for dogs, one of the most popular is made by Zodiac. This powder can be sprinkled directly onto your pet for controlling flea and tick problems. The Zodiac Flea & Tick Powder is an affordable way to bid farewell to fleas, ticks, and lice on animals over 12 weeks of age. Note that this is not a diatomaceous earth formula. Instead, it uses pyrethrins and piperonyl butoxide which kills pests on contact. You may want to look into a powder for flea and tick treatment if your pet objects to sprays or baths. The Zodiac Flea & Tick Powder has a shaker top that makes it easy to distribute it over your pet’s fur. Just be sure to avoid getting it into your dog’s eyes. Most people that have used this are pleased with its effectiveness and also comment on the fact that it has a pleasant odor—unlike some other flea and tick treatments. 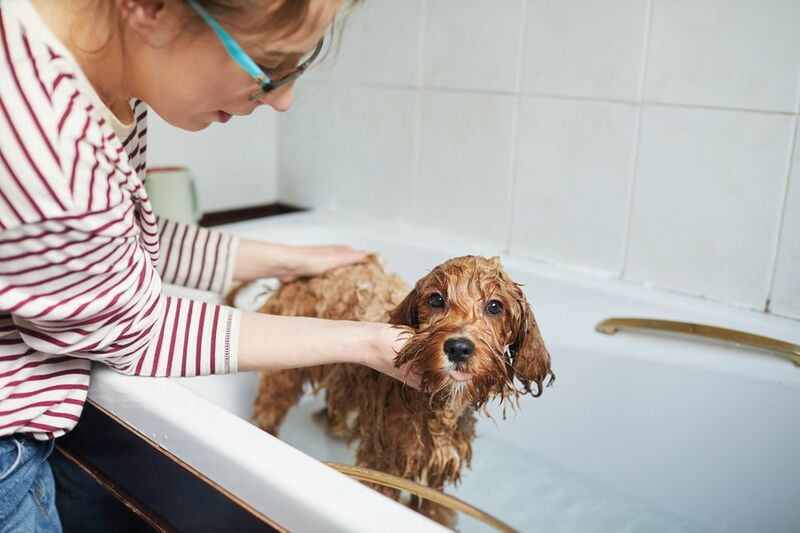 If you want to give your pet a quick lather that will target fleas and ticks, there are a number of flea shampoos available. This is also usually an affordable way to treat fleas on a budget. Our top choice is Bio Spot Active Care Flea & Tick Dog Shampoo. This shampoo for flea treatment is a good choice since it kills ticks, lice, adult fleas, flea larvae, and flea eggs. Not all flea shampoos for dogs are capable of killing flea larvae and eggs, but this formula will continue to keep fleas at bay for up to 28 days. Since fleas are prolific egg-layers, you want a shampoo that will also eliminate the eggs and larvae. Unlike some other flea and tick treatments for dogs, most people find this shampoo to be pleasant smelling—and their pets agree! While some people noticed that there seemed to be more fleas on the surface of their pet’s coat immediately after the flea bath, the manufacturer points out this can happen as the agitated fleas come out from underneath the coat to die. So you may want to be prepared to follow this bath up with a flea combing session. To really tackle your dog’s flea and tick problem, you will also need to treat your pet’s environment. This means using a treatment spray on your home’s carpet and upholstery. The Adams Plus Flea & Tick Carpet Spray is one of the most popular products. This aerosol flea and tick spray is designed to eradicate pests that may be hiding in your carpet fibers, on your couch, or clinging to window treatments. The manufacturer says that it won’t stain or leave a residue and people that have used this product. So you don’t have to worry before spraying it on your carpet or couch that it will leave any lasting marks! This flea and tick spray for carpet and upholstery is also a good choice because it contains an insect growth regulator which will interrupt a pest’s life cycle. It has been noted, though, that the can doesn’t necessarily cover 2,000 square feet as claimed. The manner and intensity with which you spray the product will likely determine if you’re able to cover the maximum square footage or not. Even still, the Adams Plus Flea & Tick Carpet Spray is a valuable weapon when waging your war against fleas, ticks, and other pests that have invaded your home and your pet. If you’re looking for a natural flea and tick spray for dogs, Vet’s Best plant-based formula is a top choice relied upon by many pet parents. This natural flea and tick treatment is safe to spray directly on your dog, and can also be used to treat upholstery, pet bedding, carpets, and more. It won’t stain and most people find the smell to be acceptable—or even amazing. Blended into each bottle are essential oils that kill fleas and ticks on contact, but also kill flea eggs as well. Generally speaking, people are thrilled with the results of this spray—and it’s not uncommon to see gleeful pet owners uploading pictures of many, many dead fleas that fell victim to this highly effective flea and tick spray. For a natural pest control product, Vet’s Best Flea & Tick Pet and Home Spray is one of the most widely-praised and is worth trying if you want to tackle your dog’s flea and tick problem with essential oils.